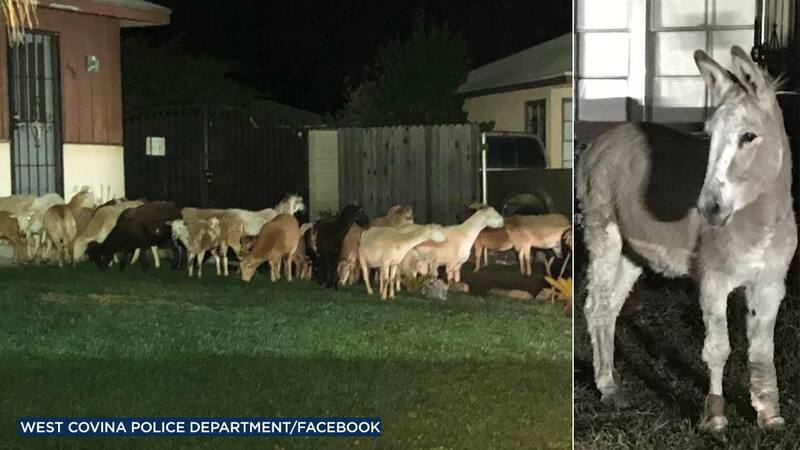 WEST COVINA, Calif. -- A herd of escaped sheep and goats led by a lone donkey took a midnight stroll through the streets of West Covina before being corralled by police. At around 12:30 a.m. Thursday, West Covina police received a call about a herd of animals wandering around the area of Francisquito and Valinda avenues. When officers arrived at the scene, they said they found a donkey leading a group of sheep and goats through the residential streets. Police officers tried to corral them, but the donkey was being as stubborn as a mule and refused. Officers enlisted the help of Los Angeles County sheriff's deputies. Together, they were able to safely corral the animals. It turns out the animals found their freedom, albeit short, from an unlocked gate from a residence in Valinda. Authorities tracked down the owner of the property, who helped in herding the animals back to the home. None of the animals were hurt. West Covina police described the unusual event on social media. "When a police officer reaches the end of his/her career, most of them will say "I've seen it all". Well, let's add one more rare call for service to that list...This incident is one for the books," the department posted to Facebook, alongside photos of the animals.